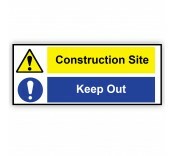 • Safe condition signs - These insist of a green background with white writing, pictures and symbols. 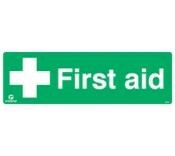 They include; directions to fire exits and fire assembly points, the fire assembly point itself, first aid box location and authorised first aid personnel signs. • Warning & prohibition signs - These consist of a yellow background with black writing and symbols when indicating to anybody nearby of possible danger or a necessary warning (danger & warning signs), and white writing on a red background when used to give orders not to do something, usually with a black picture crossed out with a red sign (i.e., no entry, no smoking, no parking, children must not play on this site, etc.). 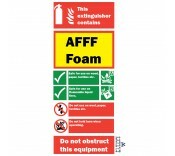 • Fire safety signs - Signs to indicate various types of fire extinguisher to be used on different materials, as well as fire alarm, fire blanket, and fire point & action signs. 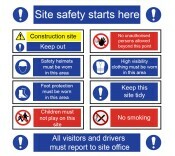 • Site safety signs - Mainly signs with white writing on a blue background, with an accompanying picture to indicate what clothing and equipment is necessary to adhere to site safety. Warning, danger and caution signs regarding site entrance points are also included in this sub-category. • Safety posters - Posters offering helpful advice for a variety of possible workplace scenarios requiring emergency action. 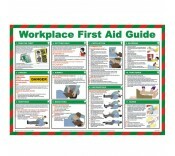 Health & safety law posters are also available here. • Highway maintenance signs - Self-adhesive, magnetic and window cling highway maintenance signs.